The Android-powered Nokia 3 from the HMD Global has recently been unveiled with Nokia 6 and 5 in India. With the surge of customers going upwards, the Nokia 3 again makes it to the top of the news because of its recent price cut. Available in Rs. 9499 from June 16 through offline retail channels, the phone promises to bear the old essence of Nokia with the power of Android. Looking back at its specifications, the Nokia 3 features a polycarbonate rear panel with the NOKIA logo. With an aluminum frame to garnish its craftsmanship, the phone features a 5" IPS LCD display with 2.5D sculpted Corning Gorilla Glass protection. The phone is available in Tempered Blue, Silver, Matte Black, Copper color variants and runs on Android Nougat 7.0. Powered by a MTK 6737, Quad-core processor clocked at 1.3Ghz the phone syncs with a 2GB RAM. Storage wise, the phone offers a 16 GB internal space with a microSD expansion option available up to 128 GB. Talking about its optical specifications, the back features an 8MP sensor with Autofocus and f/2 aperture with LED flash. Also, the selfie snapper is glued with an 8MP sensor with AF and f/2 aperture. The phone houses a 2630 mAh Li-ion battery. Supporting 4G LTE connection the phone features Micro USB (USB 2.0), USB OTG, Bluetooth, Wi-Fi and 3.5 mm audio jack as external connectivity and port options. 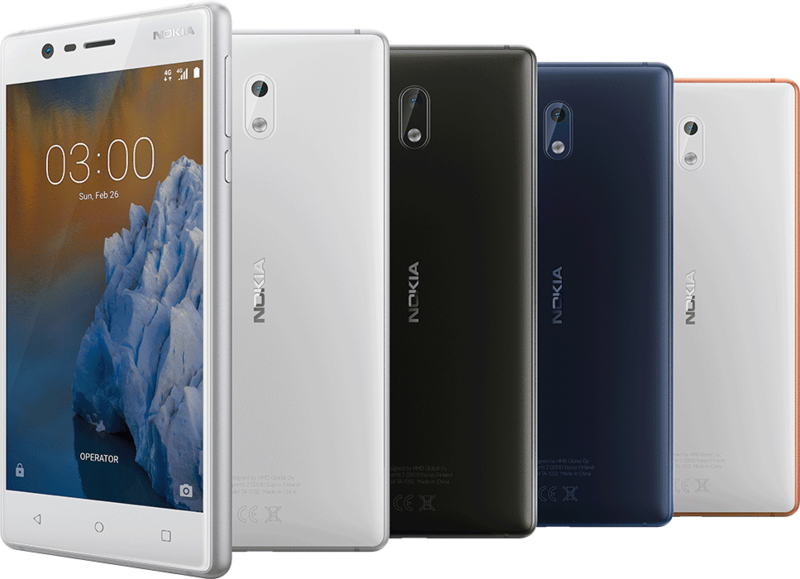 Last week, the other models of Nokia including Nokia 5 and Nokia 6 were released. In which Nokia 5 proffers a 5.2" display with Corning Gorilla Glass protection. Powered by a Qualcomm Snapdragon 430 chip with 2GB RAM the phone further features a 13MP rear camera, an 8 MP front camera, a 3000 mAh battery, a 16 GB storage with 128 GB optional external expansion. The phone runs on Android 7.1.1 Nougat. The Nokia 6 model is equipped with Qualcomm Snapdragon 430 chip and a 3GB RAM. It has a 5.5" screen, 32 GB/64 GB storage options and a supported storage expansion up to 128 GB. Connectivity wise it supports all the basic features such as Micro USB (USB 2.0), USB OTG, Wi-Fi, Bluetooth 4.1. It also has a 16 MP rear and 8 MP front camera.